2 Bedroom, 1 Bathroom, Sleeps 4. 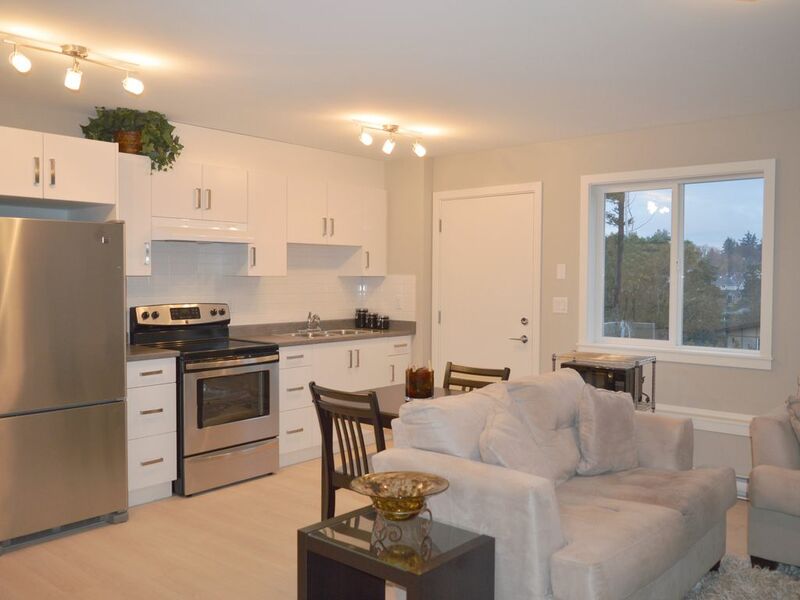 Enjoy your quiet get away in a newly built home (2015)! Your 1150 square foot bright suite is just steps away from the scenic Gorge Waterway, where you can kayak and cycle year round or stroll through the beautiful Gorge park. We are located 2 minutes from the Gorge Vale Golf course, 1 minute to a covered bus stop which is 7 minutes to downtown Victoria. The bus stop is also on a direct route to the hospital and the University of Victoria. The suite features all brand new stainless steel appliances. Each bedroom has a queen size bed and a big fluffy duvet. There are also new TV's with a library of over 300 dvds to choose from. The kitchen is fully equipped to cook at home if dining out in one of Victoria's many restaurants becomes tiring. Come enjoy our beautiful climate and West Coast Lifestyle during the day and relax in the evening in your centrally located cozy home away from home. We look forward to hearing from you and sharing our beautiful home and city with you! We respect your privacy, your host's Barb and Terry. I am born and raised in Victoria and appreciate its beauty, and love nothing more than sharing all it has to offer. My husband is from Saskatchewan(rider pride) but considers Victoria his home, he is constantly saying 'best place on earth' I agree! We recently moved into this brand new home and love the area because it is in a quiet residential area steps away from the water but also so close to virtually everything. We love our home and the surrounding area because it feels like we are looking at a beautiful painting, but it is the Gorge Waterway which seems to change daily depending on the season. People kayak and walk year round on the waterway. There are special events planned around the Gorge, such as paint and music festivals and the area is closed to traffic once a year on Canada Day so local artisans and foodies can set up along the walkway for everyone to enjoy! Washer & Dryer are available for guest use, but it is not in suite laundry. Guests staying a week or more may have access to laundry room once a week. Brand new 40 inch Sony TV's and PVR's in the living room and master bedroom. Tape your programs while you are out exploring! Gorge Waterway has a well marked terrific bike path! We just spent a month at this property. Rooms were bright with living/eating/kitchen area being open concept. Unfortunately, we were sick for part of the time. This gave us the opportunity to take advantage of the huge selection of DVD's. Main bedroom was a good size with walk-in closet. Terry and Barb were available if needed. The property was conveniently located to Victoria and many tourist attractions. Overall, we had an enjoyable stay. Clean and well-equipped two-bedroom suite in a quiet and convenient neighborhood. Close to downtown, close to shopping. And we also really enjoyed a 5-kilometer loop walk around the Gorge Waterway (between the bridges on Tillicum and Admirals), it is mostly on the park path, lots of poke-stops and gyms, if you are a Pokémon trainer. We only stayed 3 days but we loved every minute here. Was a beautiful apartment and will definitely stay here again. Great place for a holiday base!! This property is centrally situated in a quiet but easily accessible location from all amenities and parts of Victoria area. Extemely well set up, comfortable and well kept. Thank you Barb and Terry for letting us share........we thoroughly enjoyed our stay!! We are very happy you enjoyed your stay,we hope to see you again sometime! Brand new suite in a upcoming neighborhood. Less than a minute walk to the beautiful Gorge waterway and park, with access to kayaking and paddle boarding. We are 2 minutes from a covered bus stop which is a 7 minutes bus ride to town and on a main route to the hospital and UVIC. Also 2 minutes away from the Gorge Vale golf course. There is plenty of parking. Looking for non smoking professionals. For extended stays it is at the owner's discretion to charge for extra visiting guests.